Image: Jesse Allen and Joshua Stevens, using VIIRS data from the Suomi National Polar-orbiting Partnership and IMERG data provided courtesy of the Global Precipitation Mission (GPM) Science Team’s Precipitation Processing System (PPS). The Pineapple Express has been wreaking havoc across much of California over the past few months, delivering unusually high amounts of rain and threatening the state with floods and landslides. 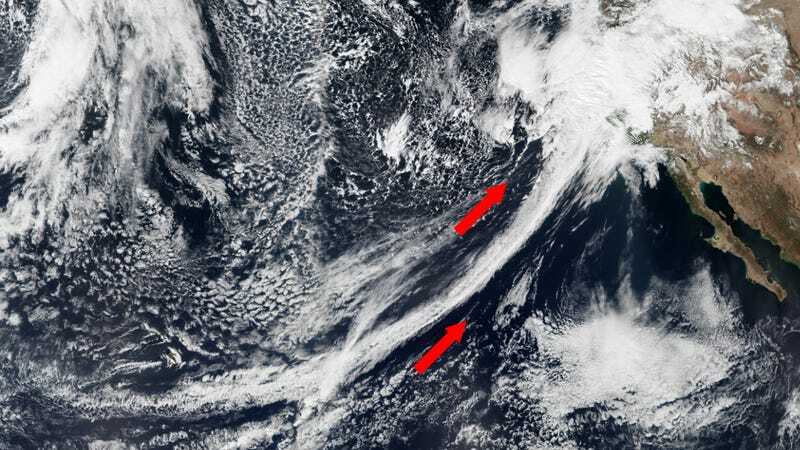 A dramatic new satellite image shows this “atmospheric river” as it extends from Hawaii to the US West Coast. They may float up in the sky, but atmospheric rivers are aptly named. Extending for hundreds of miles, these narrow columns of water vapor can channel more water than flows through the mouth of the Mississippi. When atmospheric rivers make landfall, they often release their soggy cargo in the form of rain or snow. Sometimes called the “Pineapple Express,” these enormous plumes originate in the tropics and follow a path towards large landmasses. Since early October, and after nearly five years of drought, California has faced an onslaught of atmospheric rivers. Parts of the state have received nearly twice as much rain as normally falls in the first five months of a water year, which begins in October. 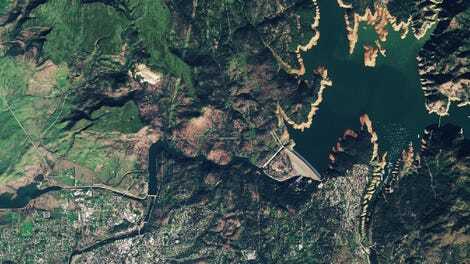 Flood and landslide warnings have been issued in many counties, at least 30 major roads have been flooded, and spillways have been opened at the Oroville, Anderson, and Monticello dams, among others. More than five inches of rain fell in parts of northern California and along the western foothills of the Sierra Nevada on February 19–20. Daily rainfall records for February 20 were doubled in San Jose (1.87 inches) and San Francisco (2.16 inches). According to Colorado State University meteorologist Phil Klotzbach and National Weather Service sources, San Francisco has received 16.38 inches of rain since January 1, while Oakland has received 20.81 inches; the typical yearly total is 22.82 inches. During an atmospheric river event in southern California on February 17–18, new rainfall records were set in Death Valley (0.65 inches) and Santa Barbara (4.16 inches). More than 100,000 people lost power in the Los Angeles Metropolitan area on February 17 due to the storms. After a short pause, the forecast across much of California is calling for more rain to return during the weekend, persisting into early next week. After years of drought, and now stupid amounts of rain, the folks in California are surely hoping for weather that’s a bit more reasonable.